Glad (you know, the company that makes, among other things, trash bags) is teaming up with the New York City Department of Sanitation (DSNY) for an Earth Day (April 10) unveiling of a photo series featuring U.S. families and the trash they produce over the course of one week. 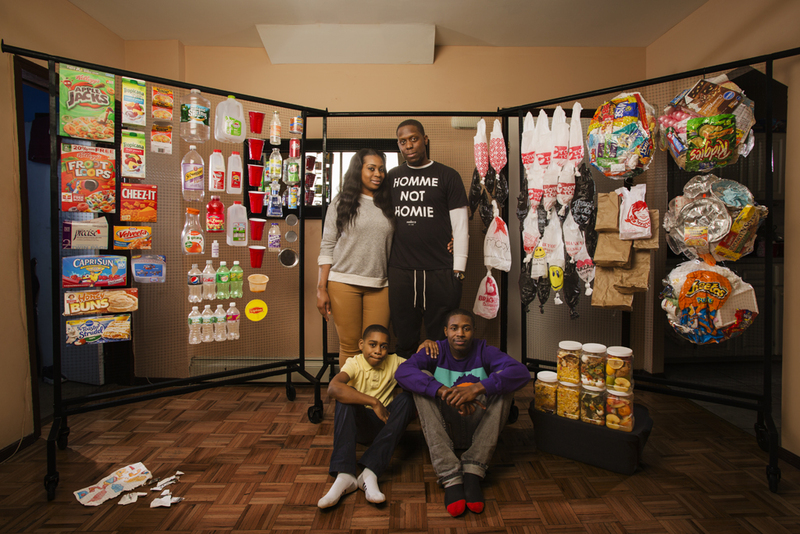 Charlene Wimms and Donell Brant of NYC, New York, with their children Darius Brant, 9, and Terrard Wimms, 16, surrounded by a week’s worth of their recyclables and landfill trash, in February. Recyclable items are on the left-hand side of the photo. Items destined for landfill are to the right. Their total household waste for this week was 28.9 lb. Seventy-nine percent of it (22.9 lb) was landfill and twenty-one percent of it was recyclables (6 lb). Photo credit: Peter Menzel. Photojournalist Peter Menzel and writer Faith D’Aluisio interviewed and photographed eight families across the country for the project, gave each family instructions to save their trash and recycling for a week, then Menzel and D’Alusio cleaned and arranged the waste for very special family portraits. I normally dread Earth Day, because as a trash blogger it means tons of extra email for weeks from companies pitching inane (and often not very Earth-friendly) products and campaigns. I have to say, though, that I like this project. It’s trash specific, artistic and informative. They call it Waste in Focus. New Yorkers can see the photos this Thursday afternoon (April 10) on display at Union Square. In nepotistic news, word broke yesterday that my little sister, Soraya Darabi, and her friend, Maxine Bédat, will soon launch an ecommerce startup called Zady. You can read more about it here, here and here, among other places. These impressive young women have teamed up to pool Soraya’s experience in the tech world with Maxine’s experience running The Bootstrap Project, a nonprofit dedicated to creating a sustainable platform for global crafts. The result: a thoughtfully curated collection of fashion and homeware focused on quality, craftsmanship and, most importantly, supply chain transparency. Of interest to trashies: Zady evolved in reaction to the “fast fashion” epidemic. Investing in high quality clothes and goods means throwing less away in the long run; and some of the designers the company features include brands breathing second lives into recycled materials. Over the weekend, AfriGadget shared this wonderful short documentary by the Kenya-based Dutch journalist Ruud Elmendorp on trashpicking craftswomen near Nakuru. The women, including Lucy Wambui, featured in a video and report on Elmendorp’s site, collect plastic bags from the dump and weave them into marketable goods. In an area of the world ravaged by poverty, HIV, domestic abuse and drug addiction, these women are bettering their lives and educating the next generation on the income they earn selling recycled plastic. Lucy, for example, pays her grandson’s school fees with part of her income. 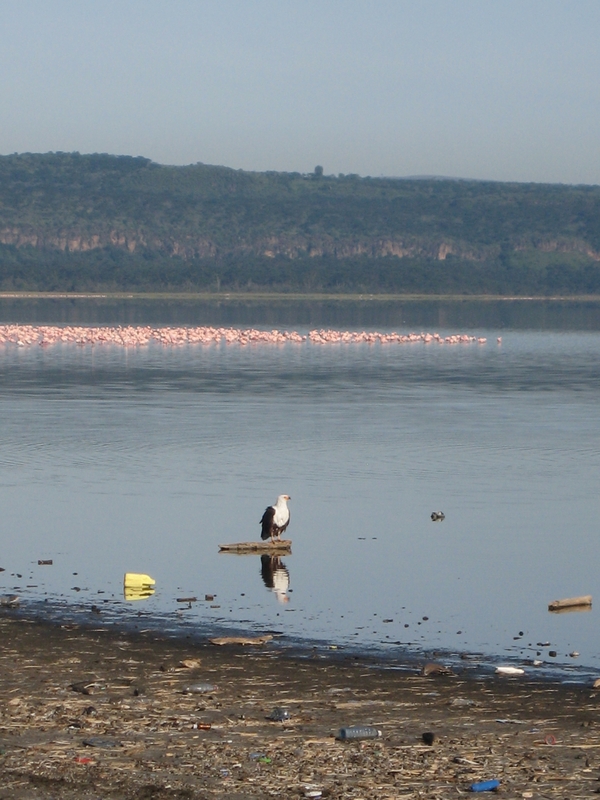 I find this piece particularly compelling because I have been to Nakuru, spent the night in the national park for which the area is famed and even spent a night in town without ever crossing paths with a community of trashpickers. Elmendorp’s shot of the dump site with flamingo lake in the background beautifully illustrates the contrast between the two worlds. It reminds me of this photo, which I shared here in 2010, taken from the shore of the same lake. How different the planet appears from the other side of the looking glass. 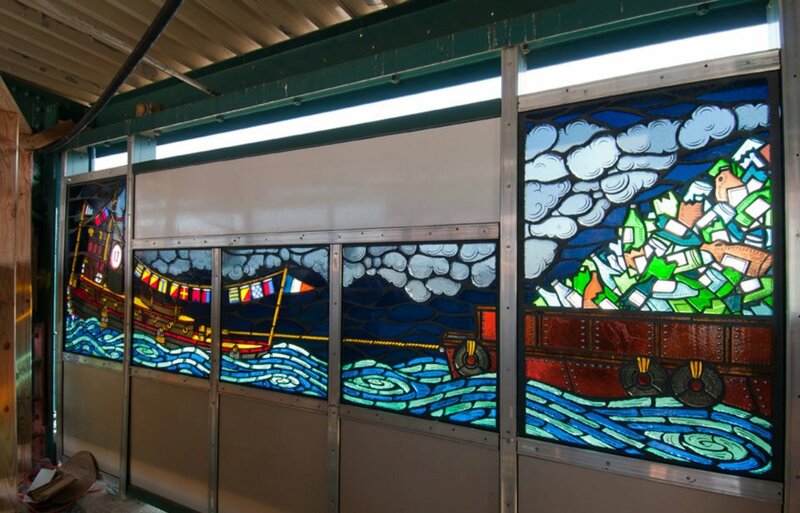 A gorgeous installation of faceted glass windows created by artist Duke Riley may now be seen at the Beach 98th Street A/S stop in the Rockaways. Tugboat hauling a recycling barge. Check out the full photoset on Facebook and the artist’s site for details on the symbolism, process and realization of this project. The MTA drawings consist of several symbols local to the Rockaways. The left side of one diptych shows two images of a Piping Plover – an endangered bird that has chosen a section of beach at the Rockaways, just a few blocks south of the 90th Street station as one of its few remaining nesting grounds. The nautical flags spell out the popular phrase “Be Good or Be Gone” which can be seen behind the doors of several pubs and restaurants in the neighborhood. I am using the phrase as a reminder for visitors to take care and appreciate the fragile environment of the area. This is a wonderful reminder of all the magical places the NYC Subway system can take you. Thanks for the tip, Gillian! Field trip anyone? Reading this ambitious book review of The Spirit Level: Why More Equal Societies Almost Always Do Better, written by Richard Wilkinson and Kate Pickett, I can’t help but to share the insight that it seems that the more egalitarian a society (be it a nation-state or a state within a nation), the more trash gets recycled by its people. Adding this to the list of the many trashtastic outcomes of redistribution of wealth. Peter Lehner of the NRDC wrote about recycling at the US Open on the Huffington Post yesterday. His article and these promo videos highlight some nice steps the event is taking, namely using recycled and recyclable disposable products in the food court and recycling the thousands of tennis balls and tennis ball cans it takes to put on the tournament. Makes me wonder: why do tennis balls come in plastic cans? Earlier this week the everydaytrash.com team was invited to a screening of “No Impact Man,” a documentary about journalist Colin Beavan, a.k.a. No Impact Man, his spouse Michelle Conlin, their cute-overload daughter Isabella and the family dog Frankie. Behind the documentary are directors Laura Gabbert and Justin Schein, and producer Eden Wurmfeld. For several years now, Beavan has been updating the world on his No Impact Project—his endeavor to spend one year wasting as little energy and as few resources as possible—via his blog, No Impact Man. The documentary follows Beavan, Conlin, daughter and dog over the course of the project, from November 2006 to November 2007. Throughout four phrases, the family gives up more and more, starting with taking non man-powered transport of any kind, buying anything new (including toilet paper), eating meat, using the elevator. Finally, they shut off the power in their apartment and attempt to live without electricity. Why make a documentary about how a family tries to live emissions-free for a year, but not give you the results on screen? The concpiracy theory would be that the team didn’t want to give out spoilers from the coming book. I don’t think so, I rather believe that Gabbert/Schein/Wurmfeld realised that watching people live eco friendly isn’t terribly exciting on screen (the most action-ridden moment being when the family tries and fails to build an Nigerian pot fridge). What is exciting is the struggle with the contemporary context they’ve locked themselves into. In the end, it boils down to how much of a crazy person you are ready to be percieved as. Easier as freelance writer (Beavan) compared to Business Week writer (Conlin). The message we are left with from No Impact Man is that you probably need very supportive friends. As a documentary about a marriage, “No Impact Man” is pretty entertaining. As a lead-by-example environmental statement, it’s a bit muddy. The film skips along, touching lightly on some of the quotidian debates of the green movement: are cloth diapers really better for the environment than disposable? What are the outer limits of eco-chic (yes to reusable shopping bags, no to no toilet paper), without really saying much. If anything, it’s a nice ad for biking and eating locally. The Union Square green market features heavily and the family spends enviable amounts of quality time scooting and biking around town. Conlin’s transformation from a Starbucks-addicted shopaholic to sustainable supermom is the real story. As she whines then copes and decides what she can and can’t live without, we make the same assessments about our own lives. How embarrassing would it be to mooch ice from the neighbor because you are consciously living without a fridge; or if the whole office knew your husband air dried his bottom as an attempt to save the trees? Remarkably, there is very little trash in “No Impact Man.” Right away, the family stops creating waste, so little time is spent tracking where waste goes when it leaves the 5th Ave co-op and what impact the family is averting. Aside from some arty close-ups of trash bags and a brief cameo by Sustainable South Bronx founder Majora Carter, trash plays a small role in the film. Anyway, as someone constantly asked “but what should I do about it” I admire the notion of living out one’s own ideals and the attempt to make personal the huge and often eye-glazing topic of lessening our impact on the environment. But there is a difference between personal and personality-driven and I found Beaven’s project off-putting in its self-absorption. Kudos to this family for eating locally, biking everywhere and spending lots of quality time together not watching TV. At one point Beaven says that when people ask what one thing they can do to make a difference, he says volunteer at an environmental organization because the erosion of community is what is killing us all. THAT point should be better underscored on his blog and in the film. A first step might have been calling the film “No Impact Family”. Entertaining and informative video from Greenpeace featuring their electronics waste campaigns. Via 365 Days of Trash. Remember when I told you I was excited to see what kinds of neat stuff came out of Maker Faire Africa? Case in point. Ghanaian-born/Nigerian-dwelling artist El Anatsui uses all kinds of cool trash in his work: from would-be discarded casava graters to the caps used to top off local home brew, to milk tins and so on. 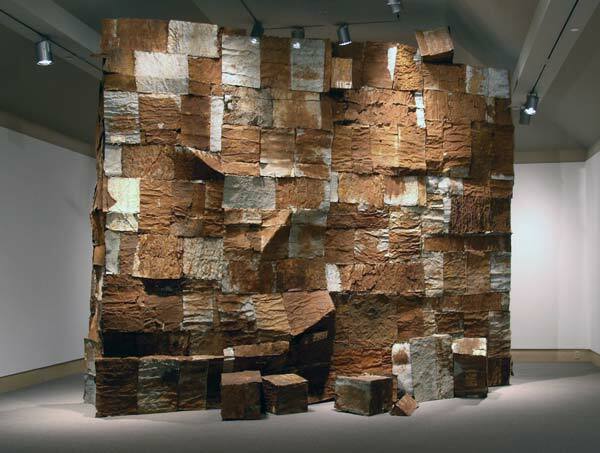 Check out the National Museum of African Art Web site for more images and to hear the artist himself describe his work, such as the Crumbling Wall pictured here. T Magazine also did a pretty good piece back in February detailing the “pop recycling” and overall “Africanness” to El Anatsui’s deceptively simple pieces that fuse everyday materials into works of art. Thanks to art historian Media Farzin for the tip. Its up to your landlord! Treehugger reports that proposed legeslation in San Francisco opens for harsh fines for residential and commercial building owners who fail to make sure trash from their tenants is recycled, and recylced properly. According to Treehugger, such legislation exists in several places already in the US, but not with fines. Makes me think of yesterday, when a note was posted at my front door. Intrigued as you always are by notes, I read it, although it was addressed to my landlord. It turned out to be notice of a $300 fine for placing plastic for recycling on the curb on the wrong day of the week. This focus on building owners is very different to my homeland of Sweden, where, as I have described earlier, the responsability for recycling lies with the individual person. And they say we’re the commies.. Decorative dumpsters are like Burberry scarves. 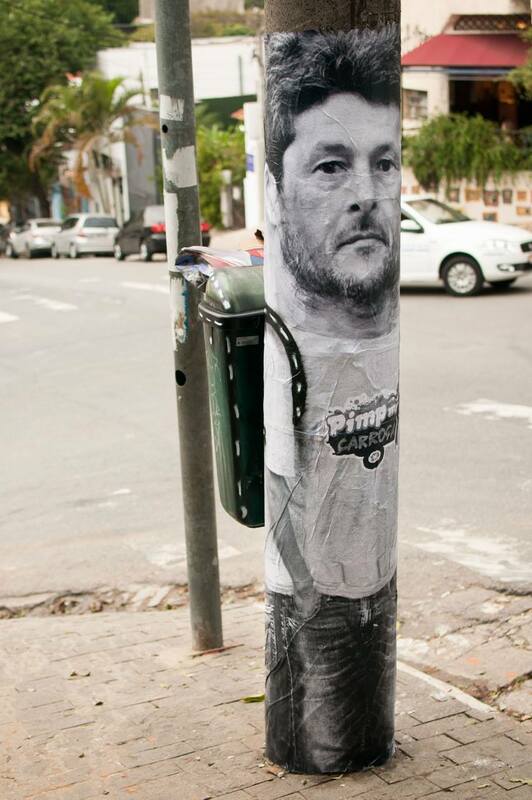 Once you notice them, you start to see them everywhere. This morning while perusing my blog reader and doing my standard searches not one but two decodumpster items caught my eye. Behold. Young artists in Tennesse decorate dumpsters for a new recycling center. The article that goes with this photo is actually kind of grumpy, pointing out that the opening of the recycling center had to be delayed in order to work out the logistics of getting the kids in to paint the dumpsters. Whatevs. It’s open now and I bet those good looking containers subtly reinforce visits to the center thus increasing recycling rates and offsetting any loss caused by the delay. That’s my theory and I’m sticking to it. 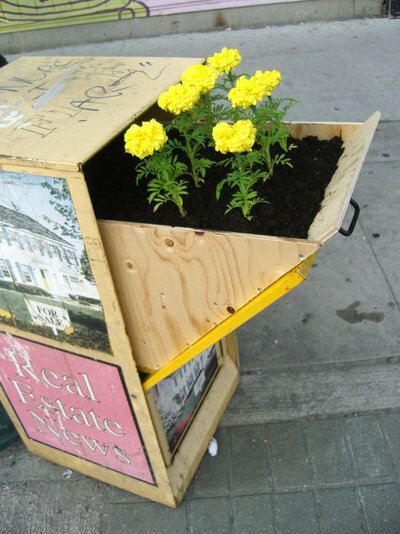 And check this out, Posterchild’s Blade Diary converts an old flyer dispenser into a flowerbox (discovered via Unconsumption). A loose interpretation of decorative dumpster but valid, I believe, since we’ve all seen empty flyer boxes stuffed with trash. UPDATE: Trash asthetics must be in the air. Bed-Stuy Banana just posted this.